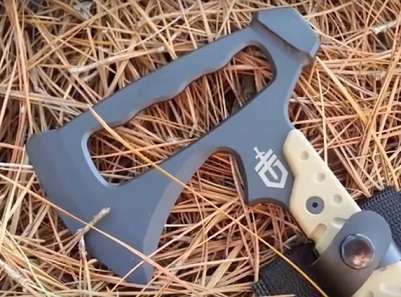 At first glance, you can tell immediately that the Geber Downrange Tomahawk is versatile and useful. It boasts a triple purpose axe head, with a beveled rounded edge, a blunt hammerhead on the back of the head, and a crowbar at the bottom of the handle. This full tang, triple-threat of a tactical tomahawk is intended for breaching, extractions, demolishing, and prying. While it is not the best tool for cutting or slashing due to the dulled edge, it is still an exceptionally powerful tool that will effortlessly destroy anything in its path. It features a protective adaptable sheath made from nylon and Kydex that includes a MOLLE brand compatible holster system. The Downrange tomahawk is a bit larger than traditional tactical hawks, but the weight is evenly balanced to ensure maximum precision control. A 420 HC steel with black Cerakote finish gives the blade added durability and a lustrous appearance. This “indestructible instrument of destruction” is really very efficient and really packs a punch. The full tang design is made of 420HC stainless steel and coated with a black Cerakote finish. 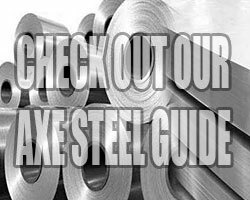 Now, 420HC is not considered the best quality when it comes to steel, but this well-made product proves its worth against some of the toughest materials. The MOLLE-compatible sheath design is a little flimsy, and doesn’t offer a very sturdy grip around the head, but overall is functional and useful for carrying purposes. 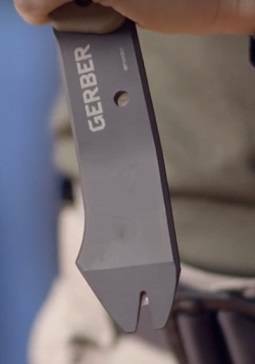 You can also feel secure in your purchase with Gerber’s lifetime warranty, so should anything go wrong you can contact them to discuss replacement options. Keep in mind; the edge of this tomahawk is intentionally duller than most hawks in order to protect the blade when it is cutting through harsh materials. For professionals such as first responders or military personnel, this tool can be an incredibly valuable addition to their toolset. The triple-purpose axe head gives you a wide range of tactical abilities. A cutaway handle complete with finger grooves in the head enhances the uniquely designed pry bar end to offer maximum support. Coupled with the hammer end strong enough to smash through doorknobs, locks, hinges, concrete, and more, and you have the ultimate breaching tool. As far as comfortable handling and grip, the G-10 handle is a desert tan color with integrated scales that will keep your hands firmly on the tool. American-made by a trusted brand that has been around since the 1930s, you can rest assured that you are purchasing a sturdy, high-quality tool. Unquestionably, I think this is a tactical tomahawk worth owning. It is on the pricier side compared to some equally powerful tomahawks, but it offers you a range of tools that could definitely save your life in an emergency situation! The corrosion-resistant Cerakote finish gives the 420 HC steel a sleek look and enhanced durability that helps maintain the life of your blade. This robust tool can break through cement, cinder blocks, doors knobs, locks, and more. It can be used to breach doorways and walls and features the unique Geber pry bar end, which makes it truly a force to be reckoned with. This tactical tomahawk can do just about anything though admittedly, it is not the best tool to chop wood with. If you wish for a sharper, more finely honed edge, you would have to sharpen it yourself, as the blade normally comes dulled. In my opinion, this axe can be considered top quality because of its versatility. Whatever minimal flaws it has, it makes up for in practicality and effectiveness. I highly recommend purchasing this for your tool set.